"Spirit of UN and Seon Buddhism Similar"
"Helping the suffering and healing the sick, these are the reasons for the religions’ existence. The spirit of the UN and Seon Buddhism is similar." Seon Master Jinje, Supreme Patriarch of the Jogye Order of Korean Buddhism took part in a meeting on October 4th with UN Secretary Ban Ki-moon as reported by global webzine ‘newsroh’ (www.newsroh.com). This time Great Master Jinje emphasized the attitude of the religions for solving humanity's problems such as war, poverty and environmental damage. "The spirit of the UN and that of Buddhism have many things in common," he added. "The issues of famine, disease, discrimination and oppression, hostility, and environmental pollution cannot be neglected by true religions," and "Fighting and hostility should end, and our environment and the ecosystem must be restored through the activities of the religious leaders," insisted Master Jinje. UN Secretary Ban Ki-moon said "I have to apologize since I am late keeping my promise of calling Turkey and Syria to prevent exacerbation of the current situation" and after the secretary excused himself Master Jinje added that "Buddhism is the only religion that has not been engaged in a religious conflict" and he also pointed out that "what the United Nations is seeking and the goals of Seon Buddhism are similar." Master Jinje went on asking Ban to "spread the message of Buddhism through the UN." "Nowadays a country is considered developed based on its happiness index rather than the economic indicators, therefore the word of a religion such as Buddhism is important," Ban responded while they engaged in a pleasant conversation. 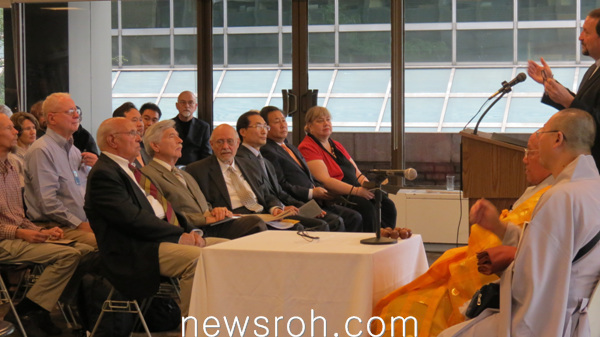 Master Jinje came to New York through the invitation of the UN Meeting of World Religious Leaders and gave a speech at the UN Plaza Building, titled the "World Peace and the Economical Crisis: Buddhist Wisdom." Master Jinje explained that the issues of war, conflict, oppression, poverty and the destruction of the natural environment are all interrelated and for solution, he suggested the practice of questioning meditation (Ganhwa Seon). In other words, disease, war, famine, environmental destruction, etc., can be solved through practicing Ganhwa Seon and finding our "True Selves." "Mankind is not only facing problems like famine, disease, war, etc., that existed since old, but also as we could not take good care of our planet, new problems have emerged that eventually can put us in a situation where even the future of our existence is questioned," pointed out Master Jinje the issue of serious environmental pollution. "That since wars begin in the minds of men it is in the minds of men that the defenses of peace must be constructed." After introducing a phrase from the Constitution of UNESCO, it was also added that if each individual cleanses their mind through practicing Seon, the conflicts can be dissolved, global peace and the protection of our environment can realized. Ambassador Kim Suk, representative for Republic of Korea in the UN and Son Se-joo New York Consul General, diplomatic officials as well as Protestant, Catholic and Muslim religious leaders were present adding up to more than a hundred participants. "Me and you are not two but one." The Korean Seon Master during the presentation also recited one of his own poems and wished that "Could we all contribute to world peace through every day Seon practice, happiness would fill the world." The Korean Buddhist leader also introduced the anecdote about the poet Su Dongpo, who lived in Northern Song China, and has realized 'the oneness of person and nature' through the guidance of a master. "We should understand that not only the Holy Scriptures, like the Buddhist Sutras, the Bible or the Koran, but also inanimate objects, such as pebbles and water are teaching us the truth," explained Master Jinje. "Global peace, equality, and healthy environment can all be achieved if we can realize the truth of 'Me and you are not two but one' through the mind cleansing practice of Ganhwa Seon," emphasized Master Jinje.